Science marches on at a blistering pace. The star-trek "replicator" that seemed preposterously far-fetched is now here. An 83-year-old Belgian woman is able to chew, speak and breathe normally again after a machine printed her a new jawbone. Made from a fine titanium powder sculpted by a precision laser beam, her replacement jaw has proven as functional as her own used to be before a potent infection, called osteomyelitis, all but destroyed it. The medics behind the feat say it is a first. "This is a world premiere, the first time a patient‐specific implant has replaced the entire lower jaw," says Jules Poukens, the researcher who led the operation at Biomed, the biomedical research department of the University of Hasselt, in Belgium. "It's a cautious, but firm step." In this operation, a 3D printed titanium scaffold was steeped in stem cells and allowed to grow biocompatible tissue inside the abdomen of the recipient. Then, in 2009, researchers reported successfully printing copies of whole thumb bones - opening the way for the replacement of smashed digits using information from MRI scans. By using an MRI scan of their patient's ailing jawbone to get the shape right, they fed it to a laser sintering 3D printer which fused tiny titanium particles layer by layer until the shape of her jawbone was recreated. It was then coated in a biocompatible ceramic layer. No detail was spared: it even had dimples and cavities that promoted muscle attachment, and sleeves that allowed mandibular nerves to pass through - plus support structures for dental implants the patient might need in future. The team were astonished at the success of the four-hour jaw implant operation, which took place in June 2011 but which has only just been revealed. 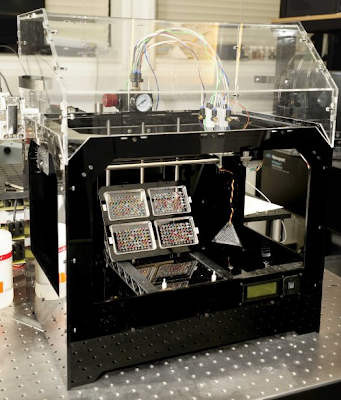 3-D printers can produce gun parts, aircraft wings, food and a lot more, but this new 3-D printed product may be the craziest thing yet: human embryonic stem cells. 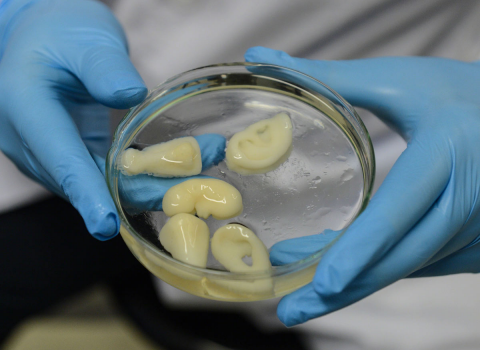 Using stem cells as the “ink” in a 3-D printer, researchers in Scotland hope to eventually build 3-D printed organs and tissues. A team at Heriot-Watt University used a specially designed valve-based technique to deposit whole, live cells onto a surface in a specific pattern. After being squeezed out of a thin valve, the cells were still alive and viable, and able to transform into any other cell in the body, the researchers say. It’s the first time anyone has printed human embyronic stem cells, said lead researcher Will Wenmiao Shu, a professor at Heriot-Watt. The words fascinating and remarkable do not remotely describe this technology. Unbelievable comes close, yet here we are. I cannot imagine advancements in the next 20 years let alone 100 years from now.